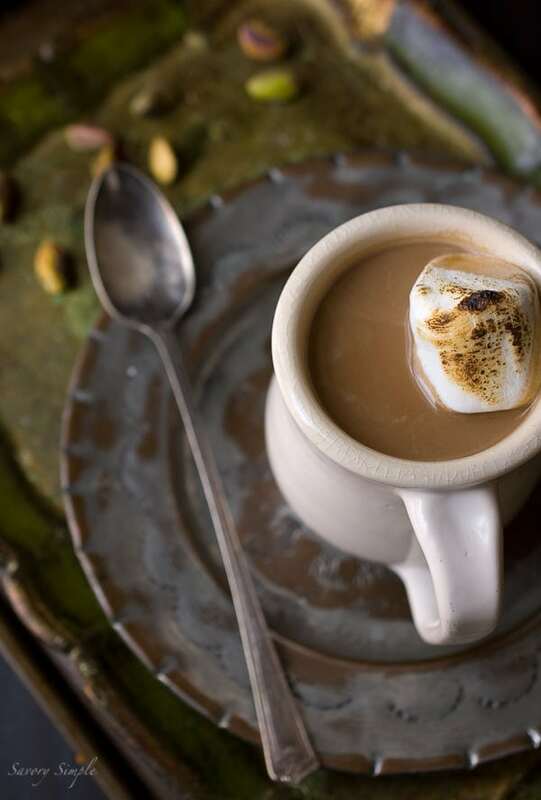 Pistachio cardamom hot chocolate is a delicious vegan, gluten-free dessert. If you love unique hot chocolate recipes, you need to try this! I love the flavor combination of pistachios and cardamom. Last year I made pistachio cardamom cookies and to this day they’re one of my favorite dessert recipes on the blog. This particular recipe evolved from my love of homemade almond milk. I make it regularly but I also love to experiment with other nuts and ingredients (check out my homemade coconut milk). 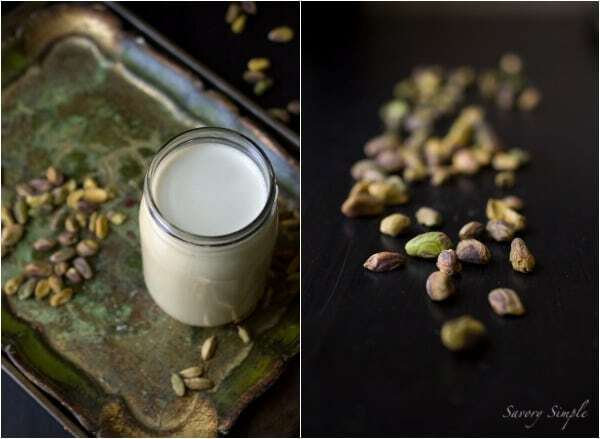 Pistachio milk is wonderful by itself with or without the cardamom. Use it in smoothies, cereal, even coffee. Or heat it up, throw in some cocoa and a few other ingredients and voila: pistachio cardamom hot chocolate. Vegan, dairy free and delicious. (disclaimer: the toasted marshmallow in the photograph is not vegan). Looking for more hot chocolate recipes? Be sure to check out my White Hot Chocolate, and my Hot Chocolate with Whipped Cream Melting Hearts! Pistachio cardamom hot chocolate is a delicious vegan, gluten-free dessert. Cover pistachios in cold filtered water and refrigerate overnight. The next day, drain and rinse the pistachios. Add them to a blender or food processor with 2 cups filtered water and 2 cardamom pods. Puree on high speed for 1 minute. Drain pistachio milk through a nut milk bag or several layers of cheesecloth. Use within 3 days. Yields 2 cups. Heat pistachio cardamom milk over medium heat. Ladle a small amount of the milk into a bowl with the cocoa powder and whisk until smooth, then pour the mixture into the pistachio milk. This will prevent the cocoa from lumping. While the mixture is heating, whisk in agave nectar, ground cardamom, vanilla and salt. Once the mixture is hot, serve immediately. I LOVE THIS! I made something similar recently with homemade cashew milk but this looks way better. And your photos? So stunning! Thank you so much, Winnie! I love homemade cashew milk as well. How did I miss this series? Glad you posted one of my favorite Depeche Mode songs. Your words…what can I say? Thanks for sharing. Parallel past experiences it seems at times. Not always easy to look back and reflect. Love the soft, reflective mood of your photos. Such unique flavors for hot cocoa! Your recipe and music selection…..Como não amar? 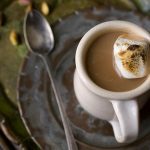 Once I had seen this Pistachio Cardamom Hot Chocolate recipe, I had to try it , simply because it was a combination of flavors I had not tried and it sounded like a quick challenge to stretch my palate , just enough without compromising. 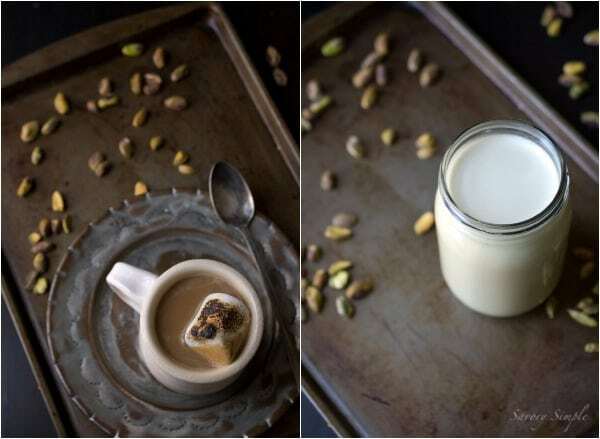 Today I made the Pistachio Cardamom Hot Chocolate , and I believe I will make it again ; however I think I will double the amount of pistachios and perhaps add a little more vanilla ( using the same amount of water as in the recipe. I can see that this recipe will have great appeal for those who are lactose intolerant or those who are ready for a change in the per usual hot chocolate, dare I say “decadent” . Thanks for sharing.